The political momentum of Venezuela’s opposition swelled Saturday amid massive street protests in Caracas and the reported defection of a top military official in the embattled Nicolas Maduro government. Venezuela’s self-declared interim president, Juan Guaido, urged people inside and outside the country to show their support in peaceful protests. Tens of thousands heeded Guaido’s call in Caracas as demonstrators hit the streets in support of early elections. Maduro has been under fire by world leaders for undermining democracy in his country, which has been plagued by food and medicine shortages and other economic turmoil. Guaido, the leader of the opposition-controlled National Assembly, declared himself acting president last week, invoking a constitutional rule in a rare challenge to Maduro’s claim to the presidency. “In all the states of Venezuela and in every city in the world, we are going to send a very clear message. We are going to give a show of strength, in a peaceful and organized way,” Guaido said Saturday on Twitter. Guaido also told a rally Saturday that much-needed international aid destined for Venezuela will be stockpiled in three places — in Cucuta, Colombia, in Brazil and on a Caribbean island. 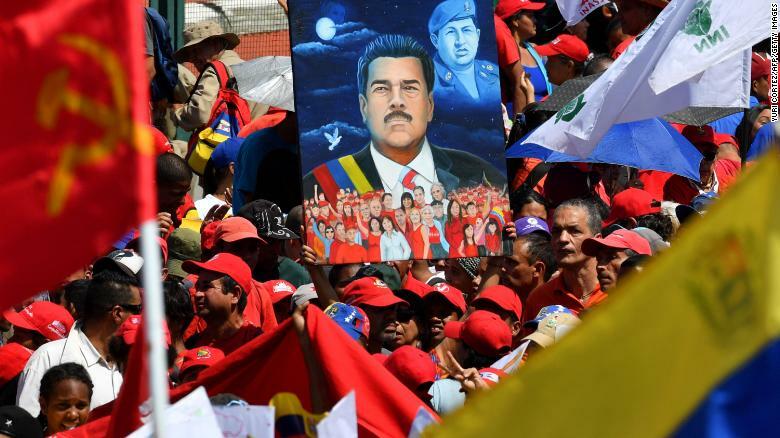 Maduro supporters mark the 20th anniversary of Hugo Chavez’s rise to power on Saturday in Caracas. There were also pro-Maduro marches underway Saturday in Venezuela. They are commemorating the 20th anniversary of the inauguration of the first government of Maduro’s predecessor, the late President Hugo Chavez. The military may play a key role in what happens next in Venezuela as pro-government and opposition protesters turn out in the streets Saturday. In an on-camera statement published online Saturday, a man identifying himself as Gen. Esteban Yanez Rodriguez of the Venezuelan air force’s high command said he has defected from Maduro’s military and declared his support for Guaido. Venezuela’s air force website lists Yanez as the head of air force strategic planning. An accompanying photo appears to show the same man as in the defection video. The man in the video said he no longer recognizes the dictatorial authority of Maduro and claimed that “90% of the armed forces” do not support Maduro but stand with the people of Venezuela. “To continue ordering the armed forces to repress the people is to have more dying of hunger and illness … ,” he said. He appealed to his “brothers in arms” not to turn their backs on the people of Venezuela, saying all have suffered enough. The video announcement comes a week after Venezuela’s military attaché in Washington, Col. Jose Luis Silva Silva, told CNN that he’s breaking with Maduro and supporting Guaido. But the timing of the latest defection is most potent since it comes amid large-scale protests planned in Venezuela and other cities around the world Saturday, Walsh said. More than a dozen countries, including the United States, have recognized Guaido. Mexico and Uruguay called for an international conference of neutral countries to facilitate talks next week between Maduro and the opposition. Maduro began a six-year presidential term last month. He has said last year’s elections were fair, but international observers have questioned their legitimacy. China, Russia and Turkey are among the countries that have voiced support for Maduro.